Leena Krohn was born 1947 in Helsinki. She studied philosophy, psychology and literature at Helsinki University. She lives as a free writer in Helsinki. 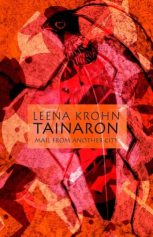 Leena Krohn has written about twenty-five books, novels, short stories, fantasy stories for children, poems, essays and radio plays. Krohn's collection of stories and essays, Matemaattisia olentoja tai jaettuja unia [Mathemathical Beings or Shared Dreams], was awarded the Finlandia Prize (1992). Krohn lives in Pernå-Pernaja south-east of Helsinki with her companion Mikael Böök. Her only child Elias Krohn was born 1977. Ihmisen vaatteissa (1976); I Människokläder (transl. into Swedish by Thomas Warburton 1989). This fantasy story has also appeared in Hungarian, Japanese, Russian, Norwegian, Bulgarian and Estonian. The movie PelicanMan, directed by Liisa Helminen (Lumifilm 2004), is based on this novel. Donna Quijote ja muita kaupunkilaisia (1983); Donna Quijote (sel. transl. into Swedish by Henrika Ringbom, Artes vol 4, 1998, ss 94-101); Donna Quijote has also appeared in English (transl. by Hildi Hawkins, Carcanet 1996), French (transl. by Pierre-Alain Gendre, Ed. ´sprit ouvert, 1998) and Hungarian (transl. by Eva Pap and Ottilia Kovacs, Polar 1998). Tainaron. Postia toisesta kaupungista (1985); Transl. into Swedish by Thomas Warburton (1987); into Japanese by Hiroko Suenobu (2002); into English by Hildi Hawkins (2004); Tainaron has also appeared in Hungarian and Latvian. Kynä ja kone (1997) [The Pen and the machine. Essays]; Transl. into Swedish by Seija Torpefält (1998). Datura (2001). Transl. into Czech by Vladimir Piskor. 3 sokeaa miestä ja 1 näkevä [3 blind men and 1 who sees]. Essays 2003.